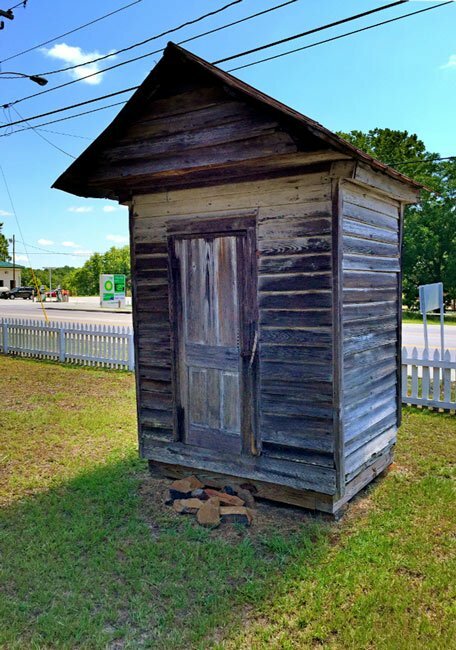 Also known as the Boney dairy house or milk house, this simple shed sits on the grounds of the Blythewood Visitor Center and Historical Society. The building was used as a cool place to store milk prior to modern refrigeration. The milk house stood near the railroad tracks, and ice delivered by train was unloaded and stored in the shed to cool dairy products. The milk shed belonged to the Boney family, one of the area’s first settlers in the late eighteenth century. Tallie Boney (sometimes spelled as Talley or Tally) was born at the end the end of the nineteenth century. A son of Charnel Boney, a prosperous cotton farmer, Tallie and his wife, Virginia, eventually bought Dr. Michael Langford’s house, built in the early 1900s, where they lived and operated a funeral home. That home was eventually razed, but some outbuildings remained on the property, including the milk shed. In 2014 the milk shed was donated to the Blythewood Historical Society by descendant Zelda Boney. The building was relocated to the Visitor Center grounds, where it now sits near Clara’s Sandwich Shop. Both structures serve as historical reminders of rural life in early twentieth-century Blythewood.